Scuba diving should be in no way competitive. If you are part of a group of divers, you want everyone to have a good time. We don’t want winners or losers. That said, the human spirit is without doubt naturally competitive and we will find ways to compete, however irrelevant. You’ll often see divers post-dive comparing how much air they used. Somehow it’s often seen as clever to use less than the next person. I was on a dive trip once where my buddy used exactly half the gas I went through. Did this mean he was a better diver? Another friend of mine was supremely fit. When his family came to visit, his wife and daughter would drive over from their home ten miles away but he would always prefer to run. The London Marathon? He completed runs across the Sahara! However, when we went of a dive trip together I was amazed at the rate of knots with which he went through his air supply. I put it down to poor technique at the time. Then I went away diving with a young television Gladiator, Hunter. He was young and fit and made me look totally puny by comparison. It was lucky he could easily manhandle an 18-litre cylinder instead of the more usual 11-litre (80 cu.ft) cylinder because that is what we had to get for him to allow him any time underwater on the shallowest and most benign of dives. His lungs were obviously so large, every time he inhaled, his pressure gauge was seen to drop. One quickly comes to realize that women generally use less air than men on dives. Is it because they are serene and become part of the underwater environment unlike men who tend to be more active? Or is it because they are usually smaller than men and thus have smaller lung capacities? I’ve dived with elderly over-weight ladies who went through a lot less air than me and many other people, so it’s probably a combination of both. Recently, I was diving with twin-cylinders on the San Francisco Maru in Truk Lagoon. Some would call it a technical dive. A rather large lady of a certain age did the dives with a single 11-litre cylinder of air while her very muscular husband went in with her, armed with twin-cylinders (like me) plus an additional side-slung tank. The dives required considerable decompression stops. I asked if he carried the sling-tank for his lady wife but was told she didn’t need it. He did! He was breathing three times as much. What about my lightly breathing friend? Well, he could come back with half a tank of air when I was completely out but he couldn’t get through the night without waking up for a cigarette. He was a very heavy smoker. He also ended every dive with a humdinger of a headache. Am I saying that divers should take up smoking? Definitely not! 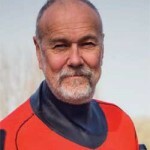 New Zealand medical anesthetist and serious technical diver, Professor Simon Mitchell has investigated a subject that could be connected with the smoking phenomenon. 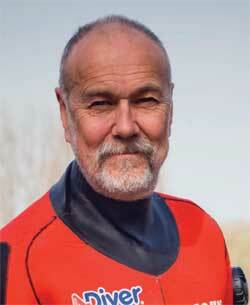 He has studied carbon-dioxide retention in divers with its regard to its effects when divers are under water. Some people are able to retain a lot more carbon dioxide during the act of breathing than others and as you may know, it is the build-up of carbon dioxide that triggers our breathing reflex. It’s not the lack of oxygen but the raised levels of carbon dioxide that makes us have the desire to breathe. As I understand it, carbon-dioxide retainers feel they need to breathe less. Speaking as a complete non-scientist, I wonder if heavy smokers with their constant lung exposure to carbon monoxide get a raised tolerance to carbon dioxide too, so that they can skip-breathe, leaving longer intervals between inhalations. Maybe their lung volumes have simply become very small due to the build-up of tar. Whatever the reason I’ve noticed they are more economic with their air supplies underwater. I once was partnered in Palau with a little Japanese girl and completely confused her by insisting her tank was much bigger than mine. Her tank reached from the top of her back almost to her the back of knees while mine only reached the top of my buttocks. Of course the tanks were both the same. It can’t be simply a matter of size. Bret Gilliam, a giant of a man both physically and in what he has achieved during his long time in the diving industry, hardly breathes at all. No doubt he’ll read this and add an explanation. Cyclist Bradley Wiggins is supremely fit. After winning the exhausting 2172-mile Tour de France, a few weeks later he was competing in the London Olympics road race. How’s that for stamina? I read on the BBC website a medical man quoted as saying that Wiggins probably has huge left ventricles to his heart, which allows more oxygen-rich blood to be pumped to his muscles than we more ordinary folk. Chris Boardman, the Olympic Gold medalist in the Pursuit at the Barcelona Olympics in 1992, with whom I once dived a lot, had a resting heart-rate at his peak of around 38 bpm which indicates a large heart. I noticed he was an experienced diver who was able to be very relaxed on dives, with good technique and perfect neutral buoyancy, so that he didn’t rush through his air although I bet had he put in as much effort swimming as he did on his bike, he might have. A person’s endurance can be measured by taking a reading, which indicates how much oxygen is used every minute for each kilogram of body weight. It’s called a VO2 Max reading. A typical young male might have a VO2 Max of around 40 whereas a top cyclist might have a value of twice that, so that not only are they able to use more oxygen, they can also keep their muscles active for longer periods of time. Of course, competition cyclists have a never-ending air supply whereas for a diver it’s totally finite. I suggest it’s not clever to use less air than anyone else on a dive, although it may under certain circumstances, be fortunate. Whatever the reason, whatever the differences between people, I suggest it doesn’t really matter. It’s more intelligent to take sufficient gas with you for the dive in question and to manage that supply in such as way that you get back safely, even if it means taking more tanks like me, and the gentleman I met in Truk. Unlike running races and competitive cycling, it’s not a competition. One of the first lesson in scuba diving. Thank you, John for your reminder with real life stories. John is right… breathing consumption is something of a mystery and really doesn’t always follow a predictable pattern. I’m a big guy… ex-football linebacker… 6-ft. tall, 250 pounds, 52-inch chest, legs like tree trunks. But my breathing consumption is absurdly low as John notes. I think a lot of it has to do with the fact that I’ve simply been diving a long time (since 1959 at age eight) and am completely comfortable and relaxed in the water… even in what others might perceive as stressful scenarios. My heartbeat and pulse rate drop dramatically within minutes of submerging (invoking the mammalian diving reflex, obviously) and a standard scuba cylinder lasts me about a month. Several diving doctors have tried to evaluate my abnormally low rate of breathing and always come away with no logical explanation. Perhaps my consumption is also distorted from a being a very aggressive deep breath-hold free diver in the 1960s and 1970s. When I did my first scuba record deep dive to 452 feet in 1990 (25 years ago Feb. 14th) I used a single 108 cu. ft. cylinder and had plenty of remaining air when I reached my deco stops. I can’t explain it. Tom Mount is about half my size and has similar consumption rates but also comes from a similar diving background and practices his own form of meditation prior to diving. I can’t explain it… but I did go to Woodstock in 1969. Never really been the same since!